The tail end of Phippsburg at low tide on a gloomy Friday afternoon. Heaven! Late Friday afternoon I was piddling around, trying to get some writing and other stuff done, when a realization struck me: It was a gloomy, cold and rainy Friday of Memorial Day weekend. Yeah, I know, when isn’t it? But it was a huge coincidence, because there’s a scene in the book I’m working on that also takes place on a gloomy, cold and rainy late afternoon Friday of Memorial Day weekend. The scene was one I’d written for a previous book and it didn’t fit, so I’d taken it out sometime during the writing process, and like all scenes like that, saved in a computer folder labeled “outtakes” for future use. It had been written for the second in my Bernie O’Dea mystery series, NO NEWS IS BAD NEWS, back when the plot was something totally different than what it ended up being. While I’d repurposed it quite a bit to fit the circumstances of the third in the series, which I’m working on — and it’s actually perfect for it — it was still a little flat and I couldn’t get it just right. 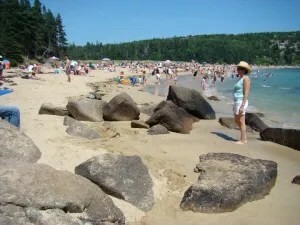 Sand Beach, Acadia National Park, summer 2010. One of the issues was the setting. My books take place in Franklin County, so nowhere near the coast. But this scene was a weekend trip to the coast. One of those little getaways (spoiler alert!) that starts with high hopes, but crashes and burns. When I originally wrote it, it was at Acadia National Park and the important part took place on Sand Beach there. When I took it out to repurpose it, that setting no longer worked and I’d been trying since last fall to settle on one that did. One that was less populated, less likely to have many people there on Memorial Day. That was a little harder to get to. Lots of things. Reid State Park, April 29. That effort took me to Reid State Park a few weeks ago, on a sunny Saturday. Loved the caution signs. They worked perfectly with the story. There were some really nice rocky parts. Still… Maybe it was the weather, but while I thought to myself “yeah, this’ll work,” I still didn’t feel right about it. So there I was Friday, piddling around at my coworking desk in Yarmouth, when it struck me that the weather was exactly what it is in that scene. So was the day of the year. Earlier in the week, my mom and I had had a discussion about why we used to go to Reid for our beach outings rather than Popham Beach State Park, where most of our Augusta neighbors and friends went back in the 1970s. Since then, Popham had been in my mind. Not for this scene, specifically, but just there. Then, earlier that day, I’d read a press release about Phippsburg, which is where Popham is. The first white settlement in Maine landed there in 1607, spent one yucky winter, then hightailed it back to England. The news release had to do with a presentation on that somewhere. Not germane. The Kennebec River in Hallowell, last week. I just can’t get enough of it. But I’d always loved that peninsula. It’s where the Kennebec River meets the ocean, and I’ve always had Kennebec River love. Fascination and obsession. There’s something about that river, and I just can’t stop taking photos of it. What did we ever do before some smart guy stuck a camera in our telephone? As a kid the fact that the same river that ran through our town burst into the Atlantic in this wondrous place always fascinated me. Could I drop something off Memorial Bridge in Augusta and go down to Phippsburg and grab it out of the water before it went out to sea? I’d wondered that as a kid. Augusta on the Kennebec. As a kid I used to wonder if I tossed something off Memorial Bridge (there was no fence then!) could I find it in Phippsburg before it went into the sea? Photo taken October 2010. In any case, Friday, as I sat at my coworking desk not really motivated to do whatever it was I was supposed to be doing, I decided to take a ride to Phippsburg and Popham. Writers are often asked about our research and how we do it. It’s not just one thing, and one big research tool for me is getting in the car and going to the area I’m writing about. There is nothing that compares to being in the place. Not only what you see, but what you hear and smell. You can’t get that from a guide book or a Wikipedia posting. I don’t want to spoil what’s going to happen in my book, but my trip to Popham (I never actually got to the beach, because I got caught up in the fort), was enlightening. I’d forgotten just how windy, long and overgrown the ride down the peninsula was. How many little sideroads go off of it. The tail end of Phippsburg, where the Kennebec meets the sea. Totally had forgotten about the fort and how cool it is. Built in 1861, it’s almost medeival in its dankness, even on a nice day. I remembered that part, because, joyously, it wasn’t a nice day. So maybe the fort will make it into the scene. See? It’s okay to get distracted while on a research fishing road trip, as I like to call them. You never know what is going to embed itself in your brain and come out in your book. I’ll be going back to get some more beach background, but just being at the end of that peninsula at the exact same time of year my characters were there, in the exact same weather, brought that scene to life in my mind and gave it the oomph I’d been looking for for months. This entry was posted in Maureen's Posts and tagged Acadia, Bernie O'Dea mystery series, Popham, Reid, writer's research. Bookmark the permalink. A cool and productive road trip – glad you had the chance to make it, and that the weather was what you needed it to be for your story, even if not how we wanted to start the long weekend.